Delocalizing intelligence to edge locations seems counterintuitive in the Cloud era, but history has proven to be cyclical also in the IT world. In the last months, “Edge” has been a skyrocketing buzzword, to highlight the fact that transmitting and elaborating data into “the Core” is not always the best choice. As found in recent IDC research, IoT users in Europe have a mixed approach to data processing and are almost equally split between processing data on-premises within a centralized platform (37%) and processing data at the edge on sensors and devices (36%). At the same time, all kind of vendors and Service Providers in the IT space are now adding “Edge” capabilities to their portfolios. 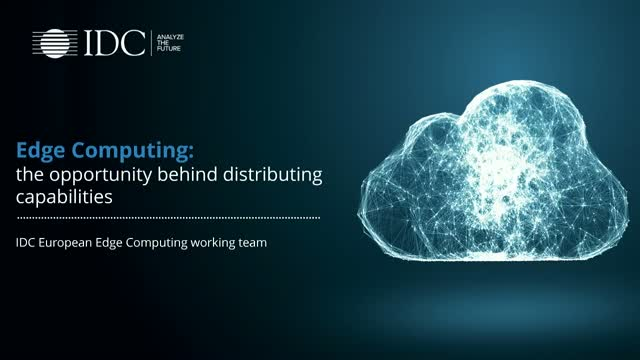 In this IDC Web Conference Gabriele Roberti, Douglas Hayward, Bruno Teyton from the Edge Computing working team will give an overview on the European Edge Computing scenario, and how this is impacting on and relating to other technologies, like the Internet of Things. - How fast the different European industries are surfing the innovation wave? - What are the key digital use cases and associated business outcomes across European sectors? - What are the next-horizon technologies and their impact on different industries? - What a “Digital Octopus vertical strategy” is for handling multiple use cases and emerging technologies, and how to build one.